Vi ønsker deg velkommen til avgangsutstillingen 2018 presentert av de uteksaminerte studentene fra Bachelorprogrammet ved Kunstakademiet i Trondheim. 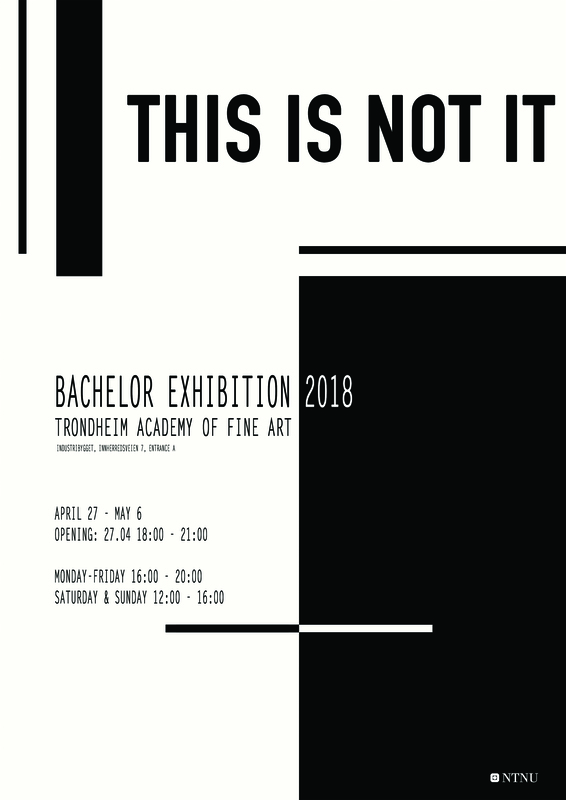 We welcome you to the final exhibition of the 2018 graduates from the Bachelor programme at the Trondheim Academy of Fine Art! One of the joys each year of the bachelor `finishing` exhibition is its vitality. There is also, in the space of this exhibition, extraordinary variety. For many of the artists involved, the work exhibited is the culmination of numerous experiments, choices taken, paths rejected – a journey of experience and, hopefully, education as well. There is a temptation to think, in the light of this exposure, that this is it: a kind of arrival. However, it is often said of journeying that it is the travel itself that is more rewarding than the destination and, given the persistence of this truism, it is not surprising that it has slipped across into practices of making, thinking and creativity more generally, not least in art. Excerpt from Out of It by professor Simon Harvey.